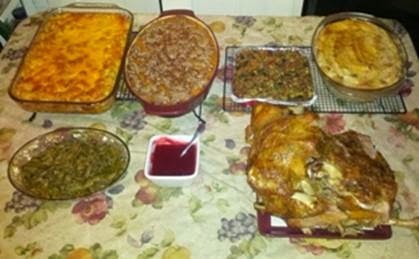 Once again, I had quite a fun time preparing a mountainous spread of food for Thanksgiving. As per usual, it was heavily carb-laden. Also as per usual, I split up the leftovers and put the majority of them in the freezer for later (more balanced) meals. Turkey – I stuffed it with carrots, celery, and onions, then rubbed it down with olive oil and seasonings. I cooked it breast-down for the majority of the meal. I tried to turn it over near the end to get the breast side a little browned, and it was already so tender that it started to fall apart, so I scrapped that idea. Transferring it to the plate also caused it to inwardly collapse, so it looks a bit disfigured in the photo. It surely did taste good, though. And now I again have homemade turkey stock in the freezer. Stuffing – Ironically, I found a small package of the stuffing from last year tucked away in the freezer. Thawed, baked, served, nice and easy! Sweet potatoes – I used the same recipe as last year. Mashed potatoes – I baked them, then added garlic, used limited butter and sour cream, and it was delicious. I don’t have an actual recipe for these, so they vary a bit each time I make them. Cheesy macaroni – Alex’s favorite item. I used the same base recipe as usual, with additional garlic and seasoning modifications like I always do. Cranberry sauce – I was so pleased with how it came out last year that I did the same thing again. This time I did not bother grating the apple since I knew I was going to puree it. I did not get it made ahead of time, so it was not chilled as fully as I wanted. Still yummy! Green beans with orange essence –It was supposed to have candied pecans on top, which worked out the first time I made the recipe, but unfortunately I burnt them beyond edibility this time so I had to leave them off. I went a little overboard on the desserts this time. The pumpkin pie came from Costco’s bakery. 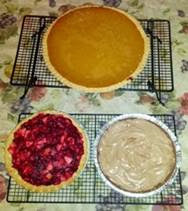 They make them from scratch, they have the homemade taste as a result, and they are inexpensive. Nutella pie – Alex loves Nutella, so this was something I made for him. I bought a chocolate Oreo pie crust and cut out 25% of the sugar, but otherwise followed the directions. I should have reduced it even more, as I thought rather unpleasantly sweet. Alex still loved it, and I am sure I’ll be asked to make it again. I will completely leave the powdered sugar out as I think the whipped cream, cream cheese, and Nutella will be sufficent sugar. I think the fruit on it would be nice, and might put it on next time even though I know Alex would prefer it without. Beekman Boys’ Cranberry Apple Pie – I found the recipe in a magazine and thought it sounded good. I was not successful in finding it online except for a copy of the magazine page. I bought a pie crust. I made the mistake of just using a 12 oz bag of cranberries and two apples from my Costco package without measuring either of those items. It ended up with enormously too much topping that completely overwhelmed the poor custard base. I basically had enough topping for two pies but smooshed it all onto the one pie. I’ll have to make it properly sometime as it definitely had potential. Overall, it was a buffet with much more food than needed, and those extras were helpful over the next few busy days when cooking was not particularly an option. I hope you and yours had some good food as well.